As internet access becomes more of a necessity, Wi-Fi remains one of the easiest and most cost-effective ways to connect to the internet outside of the main home. 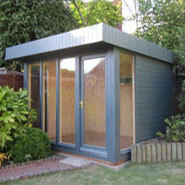 Many people use our garden buildings as a home Garden Office or as a bolt hole for teenagers. That is why we're asked so frequently by customers whether they can extend Wi-Fi to their garden office. In most cases, the Wi-Fi signal from your broadband router in your home won’t be strong enough to reach your location or if it does reach, it is very weak, making effective working difficult. Fortunately, if this is the case there are several cost-effective options available to you. 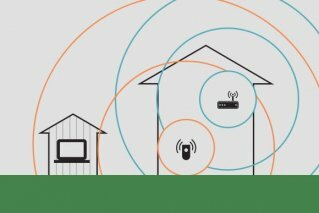 A Wi-Fi extender is a simple piece of equipment that does exactly what it says – it connects to your existing Wi-Fi network and extends the signal, creating a hotspot or bridge between the main router and your garden building. You simply plug the extender into the mains in your home, (in a location closer than the main router is in relation to your garden building), which "bounces" the signal and creates an additional Wi-Fi network that you connect to from within the garden office. 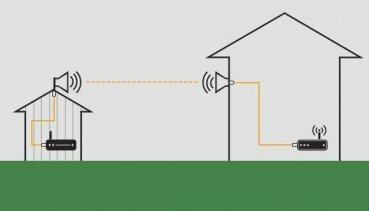 How Far Away from The House Will a Wi-Fi Extender Reach? Wi-Fi extenders are only effective within a relatively short range (around 30m) and you may require multiple repeaters (e.g. one installed in the garden office) to bounce the signal from one to another if your location is more than 30m away. An important think to remember is that signal deteriorates the further it has to reach. Therefore, if your garden building is a considerable distance away from your home, you may need to consider an alternative method. Pros: They are cheap and quick to install. More sophisticated ones will connect automatically without requiring a manual switchover. Cons: They have a shorter range, so they work better for Garden Sheds or garden buildings closer to the house. 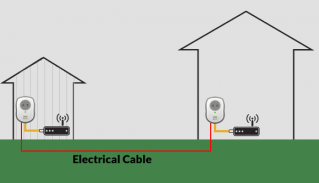 A powerline network uses the electrical power cable (between the home and garden building) to deliver the internet data between two (or more) separate units (powerline adaptors). It works alongside a Wi-Fi network and is almost wireless. It is easy to install so it should not require the assistance of an IT professional. You purchase a simple kit which usually consists of at least two adaptors, each with their own short ethernet (network) cable. One adaptor is plugged into the mains and directly connected to a router with the ethernet cable. The second adaptor is plugged into the remote location (the garden building) and either the device (PC or laptop) is directly connected to the second adaptor with the ethernet cable or a second Wi-Fi router is attached, allowing wireless connection to external devices. Pros: They are relatively cheap and easy to install. Cons: Electricity must be available in your garden building and be wired to the same distribution box. (Older properties may have more than one meter). 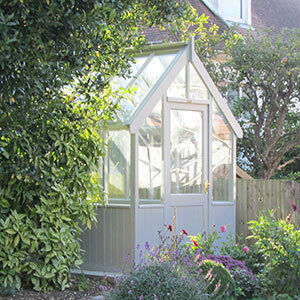 For anyone who isn't sure, read our article on How to Get Electricity in Your Garden Building. Running an ethernet cable from your house to your office is the most secure and reliable method of achieving an internet connection. 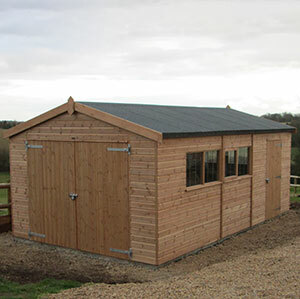 This is possibly the best option for a garden office that requires a reliable and fast internet connection. How Do I Install an Ethernet Cable to my Garden Building? 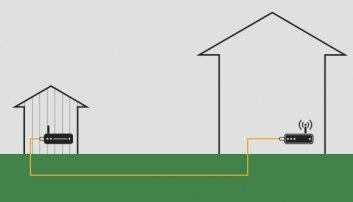 If you are planning on supplying electricity to your garden building, you should arrange for an Ethernet cable to be laid with your power cables when they are being installed. It can be installed retrospectively, but will require additional effort. Very little technical expertise is required so it should not require the assistance of an IT professional - once you have the ethernet cable in the garden building, you can simply plug this into any Wi-Fi router or directly into a device that has an ethernet port (i.e. a PC or laptop). Pros: It ensures a more reliable and secure connection. Cons: It means having a trailing cable that requires shielding from elements or through professional installation e.g. underground. Price range: £20 (ethernet cable only) plus £100 - £200 professional installation. A Wi-Fi PtP is similar to a Wi-Fi extender, but is more sophisticated and typically more reliable. Installation is more complex and requires two units to be installed: one on the outside of your house and another on the garden building. Both units require power to work and some configuration may be required in order for the units to communicate correctly with each other, so a degree of IT knowledge would be advantageous. The unit attached to your house is connected to the home network, which transmits the signal to the second device mounted on the garden building. This solution works best - and the signal is most effective - when there is clear line of sight between the two units. Trees, shrubs or other outbuildings can interfere with the signal. The real bonus to using PtP is that the range is considerably greater than that of a standard Wi-Fi repeater. This is certainly the best option if your garden building is a distance from your house and ethernet cabling is not viable for you. Pros: They work well over longer distances, so they are better for larger gardens. Cons: They are more complex than others to install and require a clear line of sight. 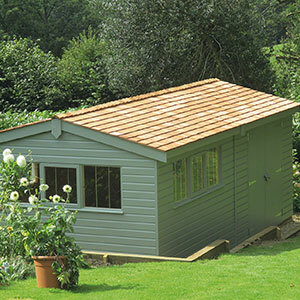 There is always a solution to obtaining a strong, secure internet connection into your garden office or garden room, meaning working from home and keeping up to date remains a viable option. 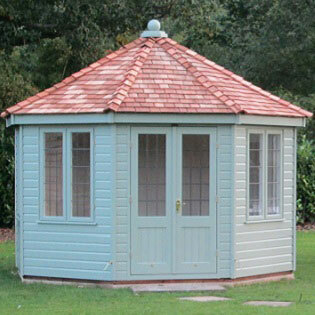 Why not view our complete range of Garden Buildings? 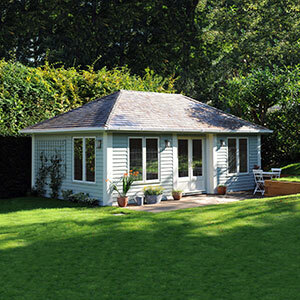 We offer Classic Sheds for storage, as well as Summerhouses and Garden Rooms for entertaining. The best way to find your ideal garden building is to see them up close. You can do this by visiting one of our seven UK Show Centres. This will also give you the opportunity to talk one-on-one with an expert member of the team about your requirements. We have the ability to install electrical packs in our buildings. To discuss your needs further, please do not hesitate to contact us. Please note that electrical packs cannot be retrospectively installed and should be included at the time of construction.